It all started, as so many connected learning experiences do, with a tweet. If Kristen Swanson #couldntbemoreexcited about #EdcampPalooza, then lurking on the #CISC2015 hashtag on Twitter with @Haydeewan seemed like an inviting activity. Probably irrationally, I was inspired to virtually attend the symposium by following its stream, collecting tweets, and then organizing them into this reflective blog post. By reordering the tweets, I think it’s interesting how common themes run across different sessions and activities. If you were at the symposium, I hope you enjoy my curation and interpretation. If you were not, I’m sure will enjoy attending virtually with me! The CISC Leadership Symposium included the largest Edcamp ever! Kristen shared the Edcamp CISC Session Schedule which, in true unconference fashion, represents the authentic interests of the participants. 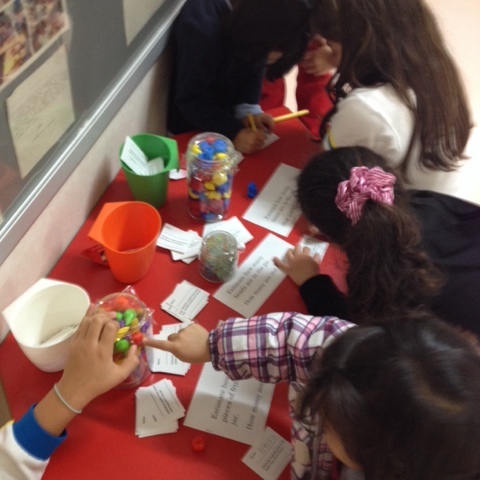 They included the divergent and ambitious inquiries that characterize self determined learning. #cisc2015 just heard a colleague say about principals and innovation-“proceed until apprehended”- a visionary leader! At Edcamp Tokyo, we asked participants to share their session notes so that everything would be published via our Edcamp Tokyo Collabornization document, a practice I would like to have seen adopted for this most epic of Edcamps. I believe that Edcamps and other ‘unconferences’ and the authentic and engaging conversations that they kindle and sustain are a model for the future of professional development. Education visionary Grant Lichtman introduced the concept of the cognitosphere, a model which provocatively represents the ubiquitous and highly dynamic nature of learning. //platform.twitter.com/widgets.jsI think a model based on the ‘4 Cs of the Cognitosphere’ could have serious traction. I see a strong connection to the 21st Century Fluencies of the Global Digital Citizen Foundation, a core resource in my approaches to teaching and learning. As the audience responses poured out from Twitter, I recognized this as an exercise in Collaborative Sensemaking and tasked myself with tabulating and organizing the results. This was a truly tedious task which I wouldn’t repeat under the same circumstances, but due to an unwavering combination of curiosity and stubborness, I completed the list below which includes the results, organized by number of entries, alphabetized, with a link to every ‘one word’ tweet at the symposium. It turns out that the educators at CISC this year describe their vision as, most wish to exude, and most want their schools to reek of ‘passion‘! I’m sure it would amuse Mr Lichtman that the word ‘grit’ appears exactly zero times. Perhaps the most exciting event at the symposium for me was Dale Dougherty’s Maker Movement workshop. Reading these educator leaders find excitement in the Maker Movement gives me tremendous hope and encouragement for the future of formal learning. In my blog post, Maker Club year 1, I reflected on my experiences with the young makers in my school and I am thrilled to see growing awareness and enthusiasm for making. I have always found value in improvisation, particularly due to being a jazz musician, as an abstract conversation and exploration of shared models, ideas, and feelings. Unfortunately, my experiences in formal education, other than my New School years, have emphasized predictability and repetition over spontaneity and iteration. Truthfully, I was shocked to see educator leaders waxing on improvisation, valuing creativity and divergent connections. Chip Heath’s observation is one of my favorite tweets from the symposium. I have often experienced the conundrum of being encouraged to innovate and redefine how learning occurs in my classroom, only to be asked later for traditional reports aligned to standards with quantitative summative assessment data. The symposium’s conciousness of change seemed to center around decomplication. In fact, the metaphor of farming, often regarded as a ‘simple’ way of life, was used to change perspective on the act of teaching. Farming is complex, but farmers tend not to be complicated. I find this analogy to be very comforting somehow. The word ‘cultivate’ has probably appeared in every one of my classroom blog posts in various contexts, although this is my first time thinking of education in terms of farming. It aligns perfectly with my ideas of LX Design and metateaching and I appreciate the organic and visceral imagery. Considering plants and animals, why not address the elephant in the room? While there are undeniably elephants being ignored at any educational conference, this elephant is another metaphor which seeks to provide a model for change. I appreciate that only emotion can move the elephant, and I believe that that emotion comes from, and should come from, the children. When we focus on the children and their stories, the elephant is unstoppable. If listening to children is ‘innovative’, then we have a lot of catching up to do. While listening to children in education may be historically new, it is gratefully older than history in terms of relationships and mentoring. It was great to see the Educator Leaders at the symposium focusing on positive developments. Fortunately, incredible learning is happening all around us, all the time. What if Trust and Transparency can empower ‘bright spots’ everywhere? What if we took Grant Lichtman’s suggestions literally? What if we discard ‘anchors and silos’ by closing county and district offices of education, convert them to community centers, and move all educators into school sites? What if educators observed a five year moratorium on conferences? Instead, apply 100% of our energy, resources, attention, and passion to finding and cultivating the bright spots within our own learning communities. Then we get back together to share. What if educational leadership was a true inverted pyramid with students at the top, determining and directing the learning, and teachers and administration below, facilitating and supporting? #CISC2015 “Not taking a risk is a risk we cannot afford.”great quote from Grant Lichtman. Great session. It’s doable. //platform.twitter.com/widgets.jsWhat if ‘the day when the risk to remain tight in a bud was more painful than the risk to blossom’ is today? The CISC 2015 Leadership Symposium was a test. A test of authenticity and courage. Without courage, nothing else worth doing is possible. So much of what I gleaned from the tweets from CISC 2015 is that educator leaders are trying to muster their courage to reform education, how we learn, into a totally new model. Looking for ‘bright spots’, adopting a design mentality, motivating the elephant, etc, it’s all meaningless if it doesn’t lead to action. With so many outstanding, inspiring, and impassioned ideas in such a short time, I hope this post has helped to synthesize some of them and provide opportunities to reflect and act. It’s been my honor to help organize Edcamp Tokyo for the second time. This year, the event will be hosted by Jingumae International Exchange School in Harajuku on Saturday 28 February 2015. Play to learn; learn to play. We decided on a theme of ‘play’ this year, which I hope will set a tone of curiosity and openness. As with every Edcamp, the key to success is self determination among the participants. Through a democratic process, sessions are proposed, voted on, and organized into classrooms and other meeting spaces. The schedule is never set in stone. Edcampers are encouraged to continue engaging conversations, break out into splinter groups, or change sessions if their interests or needs are not being met. We only ask that sharing and collaboration remain a top priority via Google Docs and our Edcamp Tokyo 2015 Home Document. I look forward to seeing how the day evolves and invite anyone to participate, even if you can’t be there in person! One of my challenges as an IB PYP teacher is how to design authentic opportunities for inquiry using mathematics. I think it’s due partly to the fact that the outcomes tend to be predetermined but also because upper elementary mathematical skills aren’t often prominent in the students’ own inquiries. My solution has generally been to provide an inquiry provocation to introduce a concept with related skills to be practiced in subsequent lessons. Recently, we completed a unit on estimation. The initial challenge was simply to estimate the number of various objects in various containers. //platform.twitter.com/widgets.jsAfter my students discussed different strategies and submitted their estimates, we engaged the school community by setting up the jars and forms in the corridor and inviting other classes to join in. The added social element was invaluable. The observations my students made about the strategies employed by the younger students had particularly strong metacognitive value, as they stimulated us to reflect more deeply on our own approaches. 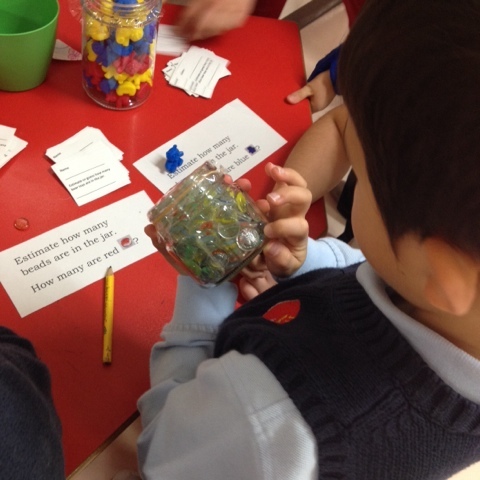 In reflection, this activity might have been better provoked by a question like ‘How do people estimate?’, providing students with more flexibility to inquire in different ways into the mathematical thinking of themselves and others. How many ants weigh the same as a ten year old girl? The student who created this poster struggled mightily with her inquiry. I appreciated her creativity in first making a moving seesaw, especially because it was likely inspired by her participation in our school’s Maker Club. 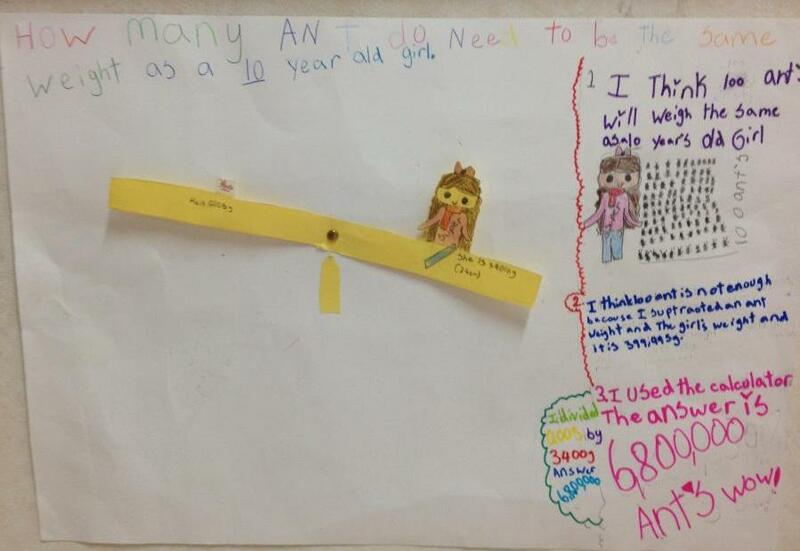 Considering her first guess of 100 ants being equal in weight to a child, it took a significant cognitive effort, a fair amount of peer support, and some careful teacher coaching to arrive at a more realistic estimate. 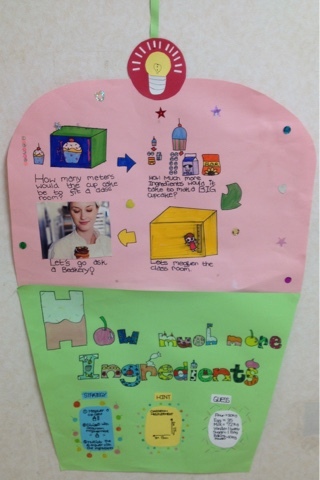 How much more ingredients would you need to make a classroom sized cupcake? The giant cupcake was beautifully presented, but illustrates the importance of action in inquiry. This student’s work was hypothetically interesting, yet I don’t believe that any of the questions or ideas were actually pursued. When the idea was introduced, I was hoping that an abnormally large cupcake would appear in the classroom one day! After creating posters to share their estimation inquiry processes, students embarked on a traditional unit of estimation practice and application in different situations. Their learning was certainly enhanced after completing their individual projects, and resulted in a clear connection between the academic and practical aspects of mathematics. This was an interesting mini unit that resulted in meaningful learning, but I would like to explore ways to tie it to a greater and more general theme. It also raises a question for me about the role of purposeful practice in inquiry learning. After all, learning outcomes are, by definition, predetermined. Is it enough to view them with suspicion when designing learning experiences, or should I actively try to eliminate them from my planning? 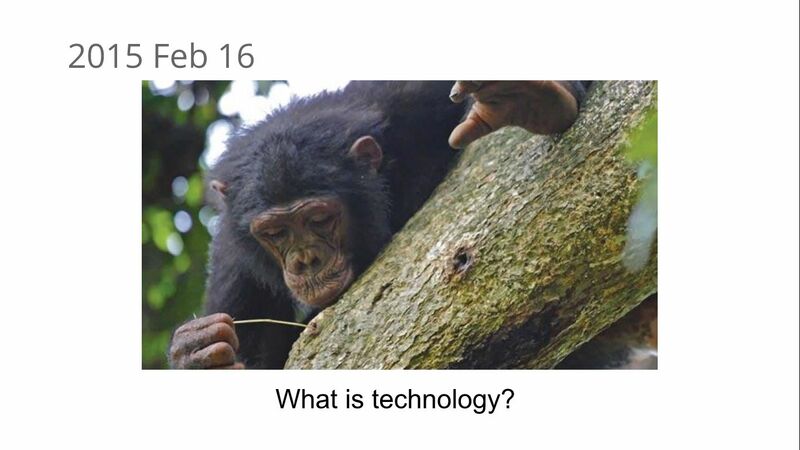 I am very excited to be registered for my first MOOC of 2015, Learning Differences, offered by the Friday Institute for Educational Innovation and MOOC-Ed, starting 9 February and concluding 22 March 2015. I discovered the course via a tweet by All Kinds of Minds, proving once again the value of Twitter as a connected learning network. The course will be divided into six units including Habits of Mind, Working Memory, Motivation, and Executive Function. Of particular interest to me is how these topics will inform and enhance my approaches to teaching in my inquiry and project based learning classroom. I’m hoping to cooperate and collaborate with members of my learning network, particularly those at inquiry, project based learning, and IB PYP schools, as well as connect with new highly engaged educators.